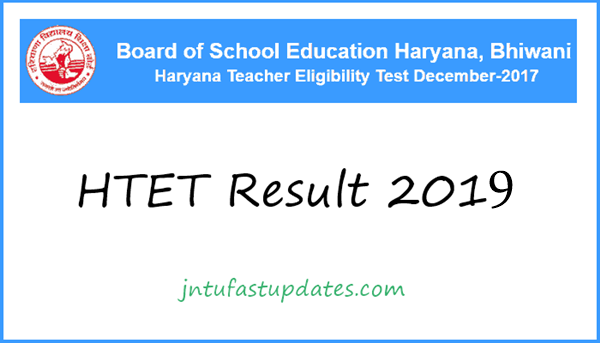 HTET Result 2018-19: Board of School Education Haryana (BSEH) has successfully conducted the Haryana Teacher Eligibility Test (HTET) Examination on 5th & 6th January 2019 across the state. A huge number of interested aspirants wishing to become TGT, PGT for Primary/Secondary schools have appeared for the Haryana TET Examination. The HTET Level 1, Level 2, and level 3 examinations were conducted by BSEH. Lakhs of aspirants have applied for HTET examination; as per reports all most all the aspirants have appeared for the test. Candidates seeking to download HTET Result for Paper 1, Paper 2, Paper 3 can visit the BSEH official website, bseh.org.in to download the result. Candidates can also check BSEH HTET Cutoff marks and merit list 2019 by visiting the official portal. Candidates can scroll down the following article to check more details about HTET result 2019 for Level 1 Level 2 Level 3. HTET means Haryana Teacher Eligibility Test. This HTET will be conducted by the Haryana Board in agreement with these guidelines which are laid down by the National Council for Teacher Education or Department of School Education in Haryana State. The Haryana Board of School Education (HBSE) has taken the responsibility for conducting the Teacher Eligibility Test 2019. Huge number of applicants has written the examinations are eagerly waiting to check the results. The applicants those had appeared for the Haryana Teacher Eligibility Test (HTET) 2019 must have to score more than the cut off marks to get qualified in the examination. The candidates those have qualified in the Haryana Teacher Eligibility Test 2019 will be given the HTET certificate which will be valid for next five years. Candidates those have qualified in this examination are needed not to write this exam for coming five years. Htet result 2019 for level 1 2 3 pgt trt prt will be available in official website htetonline.com. The cut off marks will be differ for different categories and for SC applicants there is 55% of marks is the minimum cut off marks and for all other categories applicants there is 60% of marks minimum cut off marks required. The aspirants are very eager to know about the Haryana Teacher Eligibility Test (HTET) 2018 results. The BSEH is going to announce the Haryana TET Results 2019 in March (tentatively). The HTET Result for Level 1, Level 2, and Level 3 will be released at a time by the authority. Candidates those have been appeared for the HTET on 5,6th jan have to wait until the exact result date is announced by BSEH. At the time of result, the BSEH is also going to announce the HTET Merit List for Paper 1, Paper 2, and Paper 3 with the names of qualified aspirants. Candidates can stay checking the BSEH Official website, bseh.org.in for latest updates regarding the results. The Board of School Education Haryana (BSEH) has to release the result of the Haryana Teacher Eligibility Test (HTET) 2018-19 at the official website – bseh.org.in. All those who had appeared for the exam can check the results for level 1 (PRT), level 2 (TGT) and 3 (PGT) at the website itself. HTET 2019 Results are Declared on 20th March 2019. Search for Haryana TET result 2019. Enter your Roll Number, DOB, or any other required details in the specified places.